The Florestan Trio was one of the world’s leading piano trios from 1995 until 2012. For almost seventeen years the group maintained the same personnel. Many of its records are benchmark recordings, nominated in collectors’ guides. 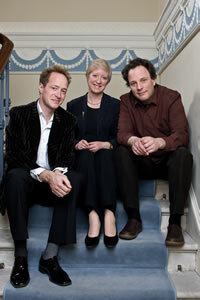 The trio recently disbanded after a sold-out series of concerts in London’s Wigmore Hall. For the trio’s recordings, please visit the Hyperion Records website. The Florestan Trio would like to announce its final season of concerts. After 16 years of exceptional achievement, and having recorded the major works of the Piano Trio repertoire to great acclaim, the career paths of the members of the Trio are diverging: Anthony Marwood will continue to develop his solo and directing activities; Richard Lester will be performing with the London Haydn Quartet, as a soloist and principal cello with the Chamber Orchestra of Europe; and Susan Tomes will pursue solo engagements and chamber music projects, as well as writing and broadcasting. The Trio’s future concerts include a tour in March, the Florestan Festival at Peasmarsh in June, and will conclude with a celebratory Beethoven cycle at the Wigmore Hall, London, in January 2012. If you would like to read reviews of these concerts, the links are on my blog on the home page, under ‘Florestan Trio Reviews’. The Florestan Trio would like to thank all its friends, audiences, promoters and trustees who have followed and supported the Trio over many years.